Super Savings Item! Free Shipping Included! Save 31% on the Huion INSPIROY G10T Wireless Digital Pen Tablet Graphics Drawing Tablet with 8192 Pressure Sensitivity Touch Function and Express Keys by Huion at Andy Pemberton. MPN: HA-US-G10T. Hurry! Limited time offer. Offer valid only while supplies last. 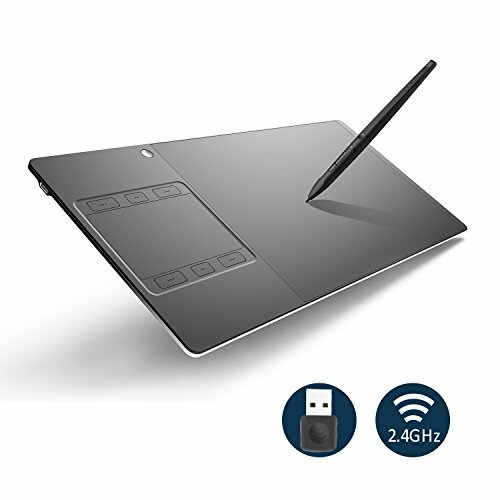 Wireless Function: quick and easy to turn G10T on and start to draw wirelessly. You can draw on the tablet with the pen and never troubled by the messy cables surrounded or limited. 8192 Levels Pressure Sensitivity: Top sensitivity in professional industry to capture and record the variation lines you draw on the tablet and immediately display on the computer. Accurate and quick response with the pen drawing on the tablet and it offers paper-like feeling. New version with upgraded touch panel and 6 customizable express keys: Easily zoom in and out the pictures with hand gestures and scroll the pages and customize individual shortcut way and skip tying and clicking to improve work efficiency and create your work more freely and arbitrarily. Suitable for both right handed and left handed users. High-end aluminum alloy rear case, pen case and type C interface design: aluminum alloy material upgrades the tablet for more fluent touch feeling and protects the tablet for complicated working environment to be more elegant and stable. Type C interface can easily plug with either direction. Wide range of compatibility: it compatible with Windows 10/8/7/Vista and Mac 10.7 or above operating systems and most currently available drawing software, such as Photoshop, Paint tool Sai, Clip Studio Paint, etc.